Cementitious waterproofing is often used in the internal wet areas such as toilets. 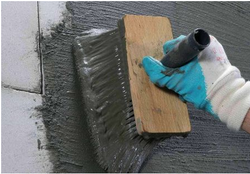 Most of the time the type of cementitious waterproofing is semi flexible, some even toward rigid type. It is still good to use because internal toilets are not exposed to sunlight and weathering and so it do not go through the contraction and expansion process continuously. 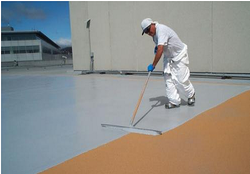 Liquid membrane is a thin coating which consists of usually a primer coat and two coats of top coats. It offers more flexibility than the cementitious types of waterproofing. The elongation properties of the coating can reach as high as 500% which may very product to product.